Our Dark Skies program, educating the community about the importance of the connection between land and sky conservation and the Five Easy Steps to Bring Back the Stars. 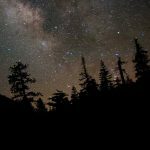 We also require language to add the requirement of compliance with the Night Sky Protection Act in our conservation easements agreements. 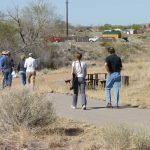 Hundreds of people in the community have participated in our educational Star Party events; done in collaboration with the Capital City Astronomy Club, Santa Fe Garden Club, Santa Fe Southern Railway, Salazar Elementary and Commonweal Conservancy, celebrating land conservation in the New Mexico and the importance of Dark Skies for future generations. 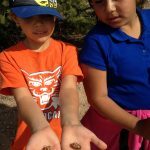 We have led field trips that have reached over 1,500 participants, including school kids from Santa Fe’s south side schools. Our work with kids helps us create the next generation of conservationists. If people don’t grow up caring about the land, they will not fight to protect it.